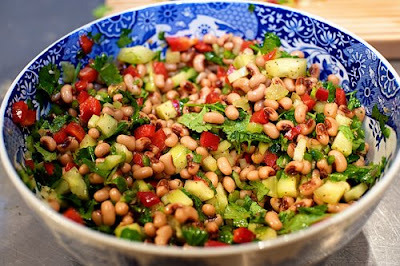 Being from the south, it was drilled into our heads that we had to eat black eyed peas on New Years Day, OR ELSE. A year of bad luck. Well, I'm cooking less and less these days since the husband doesn't share the same zip code as us. So get this. We didn't eat them and everyone seems fine today. Really! But, my southern nature will have me worrying for the next 363 days. Holding onto this recipe from The Pioneer Woman (pictured above) for next year's New Year's Day feast.